The Department of Youth and Volunteering offers again this year 2018/19 volunteer projects aimed at university students on educational reinforcement and social intervention programs, aimed at children in a sociocultural disadvantage and participate in municipal day centers. 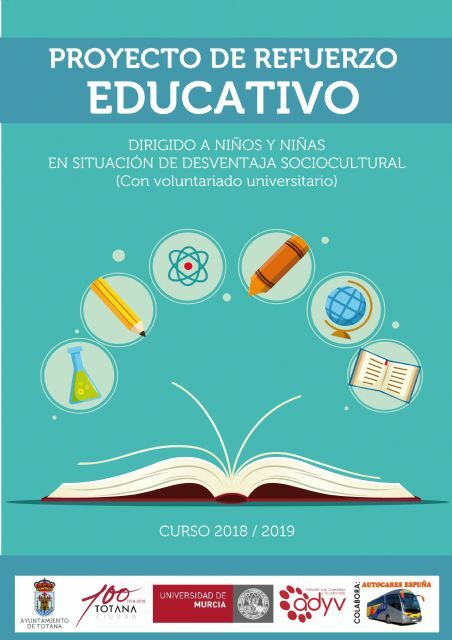 Both projects are promoted by the City of Totana in collaboration with the Service of Attention to Diversity and Volunteering of the University of Murcia. The Consistory totanero proposes the implementation of the project of educational reinforcement in extracurricular hours, aimed at children of Primary Education before the need to prevent and reduce the problems of school failure, absenteeism and school dropout that occur in Totana. In this case, the interested university students offer during this course educational reinforcement work to those students derived from the educational centers during two weekly sessions of an hour and a half each with a series of considerations or incentives. and to prevent and reduce problems of failure, absenteeism and early school leaving. The minors are proposed only by the educational centers of Totana and it is a technical team of the City Council that selects the students who will later receive reinforcement from the university students. 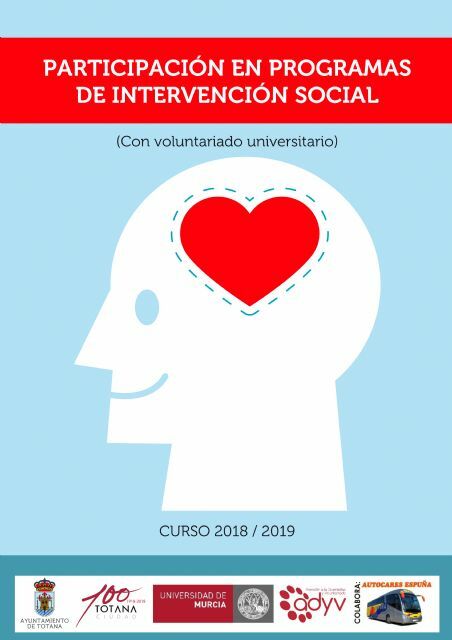 The Department of Youth and Volunteering also offers the possibility of doing voluntary university work by participating in social intervention programs in municipal day centers for the elderly, people with intellectual disabilities and people with mental illness. The City Council is considering this initiative in order to bring university students to participate through volunteering in social activities that are developed from different municipal programs. The students collaborate, together with the professionals of the different day centers at the volunteer's choice, in activities aimed at promoting the autonomy of the users and providing the appropriate support for their needs. These activities are varied depending on the day center and range from speech therapy programs, physiotherapy, sensory stimulation, music therapy, memory workshop, health care, sports and leisure workshops, cultural visits, coexistence, occupational programs, dining and party organization, among other. and provide a respite to families. and taking into account that the number of credits that can be granted per course is the corresponding to 75 hours. On the other hand, the university students who participate in these volunteer programs receive a certificate accrediting hours of volunteering action, civil responsibility insurance and support and advice for the development of the activity. In addition, the participants obtain credits of free configuration (30 credits of solidarity activity equivalent to the recognition of 1 credit, the maximum per course is 4.5 credits), or CRAU credits so that 25 hours of solidarity action equals 1 credit maximum per course is 3 credits and can be recognized up to a maximum of 6-.